A crash on Black Rock Turnpike in Fairfield, Conn., on April 3, 2019. 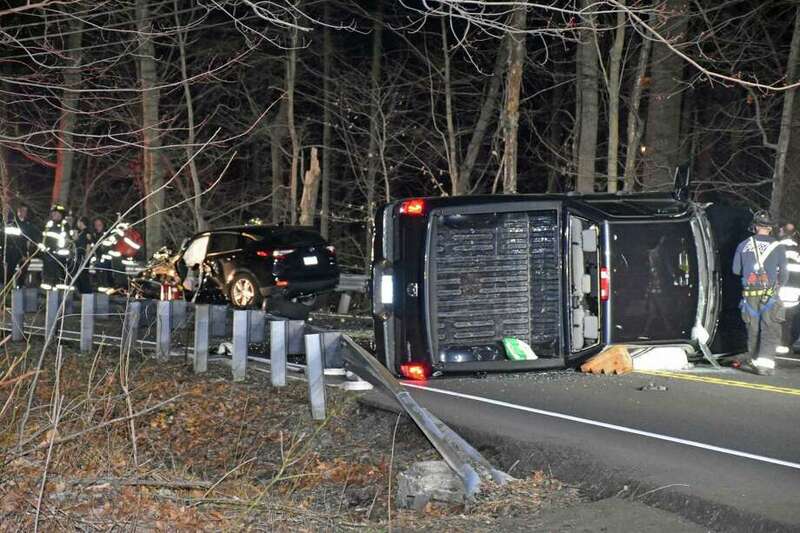 FAIRFIELD — A serious crash shut down Black Rock Turnpike on Wednesday night. The crash happened near Tanglewood Road around 8:30 p.m.
Fire officials said two people had to be extricated from a car and a third person was extricated from a pickup truck. All three had non-life-threatening injuries and were taken to a local hospital, officials said. Photos from the scene showed the pickup truck on its side across both lanes. It was unclear how long police would be investigating the crash or how long it would take to clear. This story will be updated Thursday as more information becomes available.